Connecticut Whale reveal logoThe AHL's Hartford Wolf Pack will be renamed the Connecticut Whale at midseason. Today, the marketing team unveiled the new logo that will take over when that happens. ...but this is just horrid. I mean it. This is an organization that's supposedly trying to recapture the excitement that once surrounded the Hartford Whalers. And this is the logo they plan to do it with? Guys, what happened? Very disappointing. There's your problem. Marketing to kids is important but that doesn't mean your professional hockey team's logo has to be a silly cartoon. The logo was designed by Baldwin, the Whale marketing team and designer Erik Carlson. 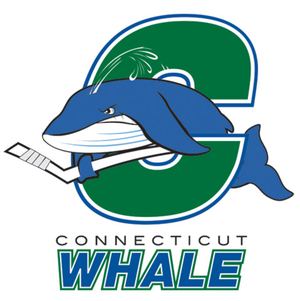 The Whale will introduce a secondary logo mark and official Connecticut Whale jersey designs at a later date. After this, I'm not looking forward to the secondary logo, but my theory is that they can only improve from here.